Welcome to the New Patient Center for Wards Corner Chiropractic in Norfolk! 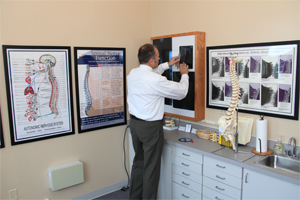 If you are new to our practice, have never received care from a chiropractor before or are just wondering what to expect during your first visit, you have come to the right place. We designed our New Patient Center to answer many of the questions you may have about our hands on chiropractic treatments, life-changing decompression traction therapy and complementary treatments for pain relief. Our family chiropractor, Dr. Brad Robinson, and his associate chiropractor, Dr. David Milot, have helped thousands of patients naturally manage pain associated with sciatica, fibromyalgia and other chronic causes. Our treatments are divided into three phases: relief care, corrective care and wellness care. This reflects our approach to whole body wellness. We don't just relieve pain. By correcting the underlying cause for your pain, we can reduce the risk of future injury and help patients live full, active lives without dependency on prescription painkillers. A healthy spine is fundamental to wellness; when the musculoskeletal system is out of alignment, the entire body suffers. Many symptoms of pain are due to a misalignment of the musculoskeletal system. Our family chiropractor uses sophisticated diagnostic techniques, including X-rays, to precisely detect and treat a wide range of musculoskeletal abnormalities. As part of our approach to whole body wellness, we also offer comprehensive services, including nutritional counseling, lifestyle advice, corrective care exercises and massage therapy and spinal & postural screenings. Our treatments include spinal decompression traction therapy, a revolutionary treatment for relieving back pain from herniated discs. Nearly every American will suffer from back pain at some point in their lives, and left untreated, this pain can lead to other complications and even result in future injuries. Spinal decompression traction therapy is a life-changing treatment that helps restore a herniated disc to proper alignment, relieving pressure on nearby nerves. This gentle and highly effective treatment has helped many Norfolk patients m anage their back pain and sciatica without medication. As a pediatric chiropractic center, we are fully experienced helping patients of all ages enjoy long-lasting natural pain relief. We believe that patients as old as just a week or as young as 99 can benefit from our treatments. Our pediatric chiropractic services can help younger children safely recover from sports injuries and manage acute childhood illnesses, such as earaches. We believe that heavy prescription painkillers have no place in children's bodies, and our family chiropractor is excited to offer chiropractic treatments as a safe alternative to the Norfolk community. In our New Patient Center, we encourage you to explore our health resources, including online forms, stress test, what to expect and payment options. Our wellness team is always happy to answer any questions you may have, so do not hesitate to call us at 757-588-8908. Use our online appointment request form to schedule your diagnostic visit with Dr. Brad Robinson or Dr. Milot today!